See also the layperson's introduction: Jumping frogs, squeaking bats and tapping woodpeckers and Picosecond ultrasonics with ultrashort light pulses. The properties of mechanical contacts between solids depend on how their microscopically rough surfaces mesh on the nanoscale, and a physical understanding of the contact area is vital in engineering and biology. Revisiting contact mechanics with ultrafast laser technology, we present a new way of probing contacting interfaces using ultrahigh-frequency sound and heat waves. We press a ceramic sphere of a few millimeters in diameter onto a chromium film of thickness 100 nm (1 nm=10-9 m) supported on a sapphire substrate. Upon absorption of a focused ultrashort laser pulse on its bottom surface, the film is heated extremely rapidly and expands, launching the sound and heat waves. A diagram of the apparatus is shown here. These waves reach the intricate contact interface, made up of nanoscale bridges between the two surfaces, as shown on the right. The waves are then partially reflected and return to the bottom surface of the film. 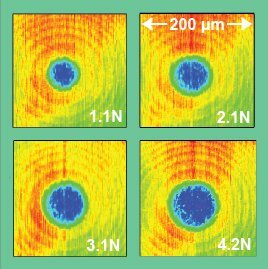 Mapping the acoustic and thermal waves at the bottom surface with probe light pulses focused to a 2 micron spot allows these nanoscale bridges to be seen. We find a significant decrease in the height of the acoustic echoes, shown above (at time t=28 ps), by an amount larger than predicted by simple theories of acoustic reflection. The echoes are also distorted in the contact region (see inset where echoes have been rescaled). We believe these effects are caused by the vibrations of the nanoscale bridges. In the contact region the echoes arrive earlier, revealing nanometer-order deformations of the film. The high frequency thermal wave maps shown here for different loads show cooler (blue) contact areas where the heat loss from the film is greater. We also detect enhanced heat flow in the near-contact regions (green annuli). This work should lead to applications in engineering for the study of friction, lubrication, and electrical or heat conduction as well as in biology for the study of adhesion or joints. See news feature in Physical Review Focus or in Photonics Spectra. 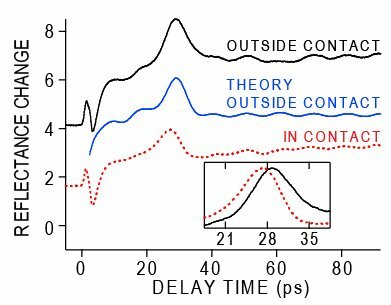 For the article, see 'Nanoscale mechanical contacts probed with ultrashort acoustic and thermal waves,' T. Dehoux, O. B. Wright, R. Li Voti, and V. E. Gusev, Phys. Rev. B 80, 235409, 2009 .